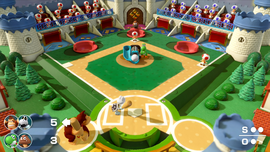 Mini Baseball League is a Toad's Rec Room multiplayer minigame appearing in Super Mario Party. It has been requested that this section be rewritten and expanded to include information on the 2-vs-2 setup. The players must play three, six, or nine innings, taking turns batting or pitching. Once the pitcher pitches the ball, the batter must swing the ball into one of the red side doors to score a hit. Hitting into the moving circular holes counts as an out, and hitting into the green troughs along the walls counts as a foul. Each hit grants the batter a Toad teammate at another base, and getting a Toad to the home plate scores the batter a point. Afterwards, the batter and pitcher switch places and repeat the process. After the given number of innings, the player with the most points wins. Explained through a single in-game prompt, the batter must swing with . "How many innings would you like to play, [player character's name]?" This page was last edited on March 17, 2019, at 17:41.